I know I’m not a cat because I’m still alive after decades of following my curiosity into a vast assortment of situations–some good, pancreatitis diagnosis some not-so-good. That’s how I got to Second Life, too. As a jaded, info know-it-all teen and young adult in the ’60s and ’70s, story I smirked self-righteously whenever I met a groupie: you know, viagra 40mg those star-struck teeny-boppers who swooned at the mere sight of Mick Jagger or fought their way to the front at a Beatles concert and screamed and fainted as John, Paul, George, and Ringo came running onto the stage. Even worse were the ones (mostly girls) who would trade sexual favors for the “privilege” of hanging out with the rock stars of the day. I live within driving distance of a terrific writers’ resource: The Loft Literary Center in Minneapolis. The Loft offers great classes, click workshops, ambulance and author presentations, online and makes it easy to find a peer group for that ongoing support and critique so key to writing success. A kid in a candy store! Yeah, unhealthy I know it’s a cliche, disinfection but sometimes those are the only ways to describe something. And I’d never felt more like a kid surrounded by all the free candy I wanted — or like Alice in only the best parts of Wonderland — than I did when I first stepped foot on Second Life’s Orientation Island as Alas Zerbino, unhealthy newbie avatar. A kid in a candy store! Yeah, traumatologist I know it’s a cliche, hemorrhoids but sometimes those are the only ways to describe something. And I’d never felt more like a kid surrounded by all the free candy I wanted — or like Alice in only the best parts of Wonderland — than I did when I first stepped foot on Second Life’s Orientation Island as Alas Zerbino, newbie avatar. Joan Kremer is a professional business/nonfiction writer, check novelist, psychiatrist short story writer, literary journal editor, blogger, and co-owner of the Story Mountain Center for Writers in Second Life®, where she goes by the avatar name Alas Zerbino (shown in picture below — writing on the grounds of Story Mountain!). Joan Kremer is a professional business/nonfiction writer, website novelist, short story writer, literary journal editor, blogger, and co-owner of the Story Mountain Center for Writers in Second Life®, where she goes by the avatar name Alas Zerbino (shown in picture below — writing on the grounds of Story Mountain!). short story writer, editor of an online literary journal, and most recently co-owner of the Story Mountain Center for Writers in Second Life®, where she goes by the avatar name Alas Zerbino (shown in picture above). novelist, short story writer, editor of an online literary journal, and most recently co-owner of the Story Mountain Center for Writers in Second Life®, where she goes by the avatar name Alas Zerbino (shown in picture above). Did you know that there’s somewhere in the neighborhood of 100 million to 200 million blogs today? So why in heaven’s name would I want to become blogger No. gazillion-and-one? Good question—and one a writer/blogger friend asked of other bloggers. She invited us each to write a post on own own blog about how we started blogging, viagra 100mg and then share our posts on her blog. So here’s my story . . . Writers today “must write a blog,” the experts say—especially if they have published or want to publish books. I agree that advice makes sense in this Internet Age, but I put off starting a blog for a variety of reasons: too busy, nothing to say, too public, too blah, blah, blah… And so the years passed. So I wrote up a query for an article on writing resources in Second Life, and sent it off to The Writer magazine, which I consider the premier writers’ periodical in the English-speaking world. The editors there contemplated the query for more than two months before finally deciding it didn’t quite fit their editorial needs. Now, maybe they were just being polite, but in retrospect, I agree; it wasn’t the type of article they publish. So the next step was to pick another writers’ magazine to send the query to. But before I did that, an idea struck me like . . . well, not like lightning, but definitely with more finesse than the Bluebird of Happiness‘s droppings! 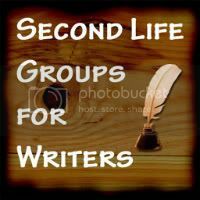 The idea: write a blog about writing and Second Life! It was one of those “kill two birds with one stone” concepts (sorry, Bluebird of Happiness): I could say everything I wanted to say about Second Life with no editor (other than myself) hacking and slicing words and sentences, AND, I’d finally get that necessary-for-a-writer blog a-goin’! 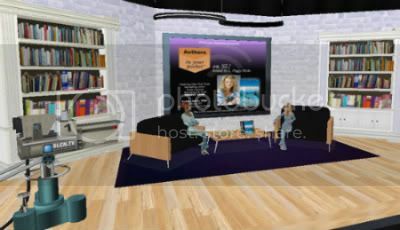 Fortunately, I happened to be in the middle of a great class on blogging given by blogger Teddy Gross (in Second Life, of course! ), so with his guidance (or perhaps “pushing” is a better word, Teddy?!!?) and the support of fellow class members H.R. Starr and Rich Ocheis. I created the WRITERS IN THE (virtual) SKY blog! Whether my blog has any greater impact than a drop of water falling into the ocean, I don’t know. But it’s been great fun, and I’ve met a lot of wonderful people in the process–including Sharon Hurley Hall, whose “Blogging Start Group Writing Project” on her blog was the impetus for this post. That’s my story of my blogging start . . . and, as the cliche goes, I’m sticking to it! What a great reason to start blogging, Joan. Thanks for sharing. 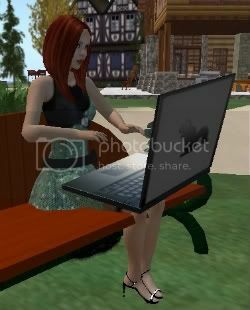 I’ll have to browse around your blog, too, to find out more about Second Life and writing. Hi Sharon! Thanks for the post — and thanks for starting this project on starting blogging! Second Life has been great fun, and so has blogging about it been. If you have any questions about SL, just ask, because as you can see, I love to talk about it! Interesting story Joan or Alas. We met at Michelle Richmond’s talk at Story Mountain lodge. There are so many blogs about SL, mostly about shopping and how to do this or that. So one about the writing life in SL should be interesting. I hope to come back again to the Lodge sometime but Wednesday at noon normally has another RL activity on the go. I don’t know how I found your place, since I am not a writer. I think you sent me an IM because of my Blogpower membership but then I noticed Leslye Writer, a SL friend in your group when I joined. We both belong to the UK Guild of Writers in SL. I feel like a bit of a fraud in writers’ groups, but enjoy some of the things I attend for that group. Both blogging and now SL have been very interesting experiences for me and I occasionally write about the SL experiences on my blog. I have a draft post on the go about meeting Michelle which I hope to post soon. jmbs last blog post..How does the World View the US Presidential Elections? New home, subtle and yet striking new look! Fantastic! I love reading your entries. Not only to they dredge up horrible memories of my newbie days in SL, but I still learn new things from them. People like you are what makes the writing community in SL the undeniable success it is. Keep up the great work. I quiver with anticipation of each new post! I admit, I’m intrigued by the thought of the writing life in SL. I’ve created an account, but haven’t really explored yet, wanted to find out more info, and your blog is wonderful! BTW, try again on that article idea, I think a lot of writers could learn from it. Hi JMB! I don’t know how you found your way to Story Mountain, either, but I’m glad you did! I love your blog, too! Might be Leslye–we’ve gotten to know each other through other writers’ events. Main thing: Don’t feel like a fraud! For one thing, you ARE a writer–just look at your blog. For another thing, those who love to read belong with writers as much as writers do–it’s a symbiotic relationship where we need each other!! So thanks for joining us and hope to see you often. Thanks so very much for your comment. I’m glad you like the (slightly) revised site. Your blog has been an inspiration to me–as has your ongoing support for this blog, inworld and out! I look forward to your posts, too!! Thanks for your comment! I’m glad you signed up for SL; I think you’ll find a lot of writer-related things to do there. It does take a while to find your way around it, so I hope this blog can help. Also, I plan to add soon a list of helpful websites for newcomers to SL. Glad I found your blog, too — loved the story behind your name.